1. Access your library and press New on the library homepage or in a view. 2. Select one of the document classes configured by the library administrators. Note: If there is only one document class in your library, the document opens in edit mode directly. 3. Fill in the title and properties of your document. A progress bar indicates how many mandatory fields have been filled in. 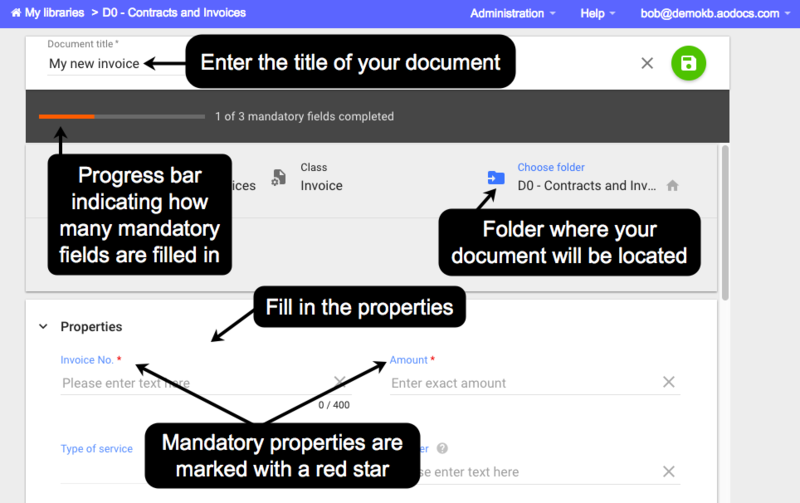 The mandatory properties are marked with a red star. When filling in properties, you can use the help text to guide you. The default help text indicates the type of data to enter (for example, numerical value or text). If your library administrator has customized the help text, it will contain information specific to your business case. In addition, if your library administrator has defined tooltips, hover over the question mark next to the property name for additional help. 4. 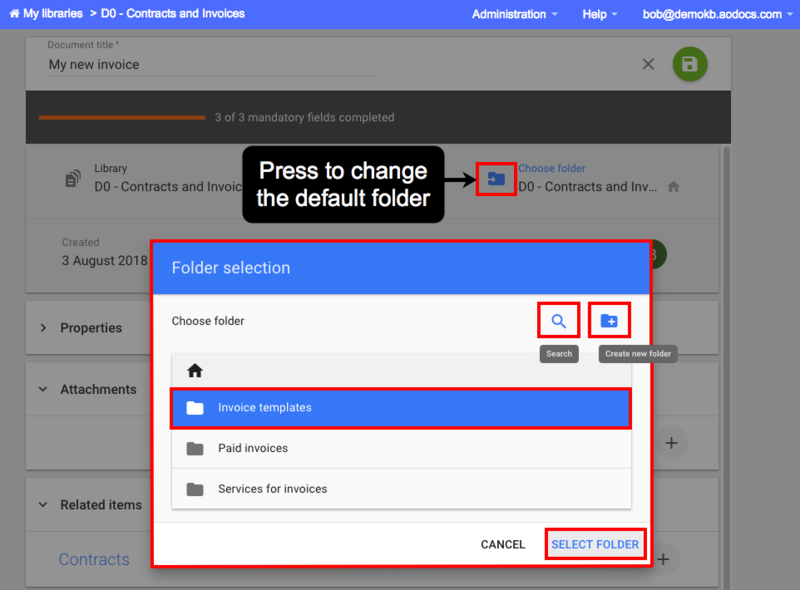 If the document class in your Document Management library has a folder structure, you can change the folder where your document will be located. 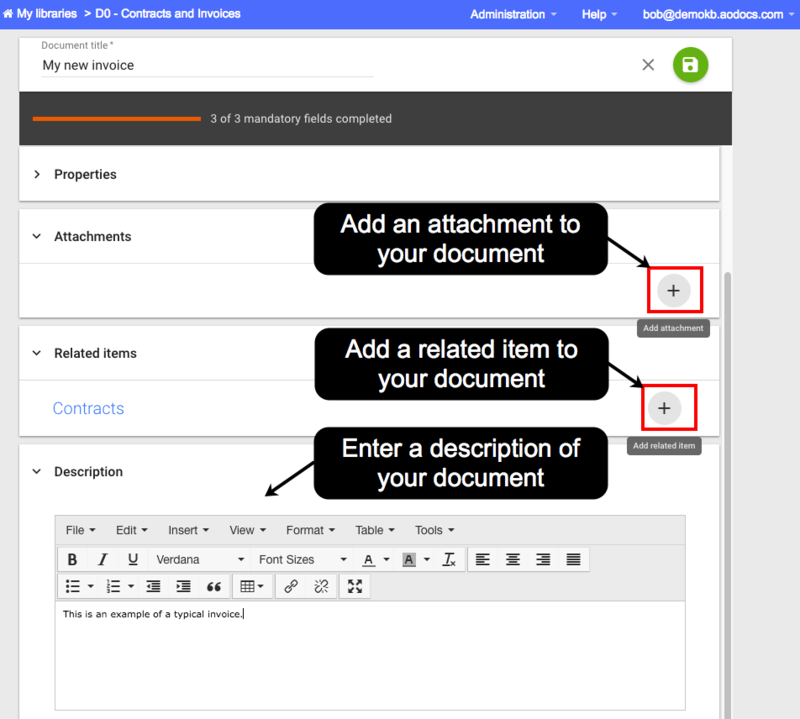 - In Document Management libraries, you can create documents with no attachments, one attachment or several attachments. - Once you've saved your document, you can add attachments by drag and drop directly into the Properties panel. 6. If relations have been set up by a library administrator, you can press the Add related items button and add one or more relations. Learn more: Use related items. Note: Once you've saved your document, you can add relationed items in the Properties panel without entering edit mode. The description is displayed in the Properties panel of the document. The text in the description is searchable by the AODocs search bar. - The description field may be mandatory if the field permissions are managed by workflow states. - You can only insert images in the description once you have saved your document. 8. Press the Save button to create your document.